The Three Jaegerteers: Enter Striker Eureka! You know what's better than a package in the mail? A surprise package in the mail. A surprise package WITH A JAEGER IN IT! Oh, the delightful shriek I emitted was probably not meant for human ears. Photodump get! 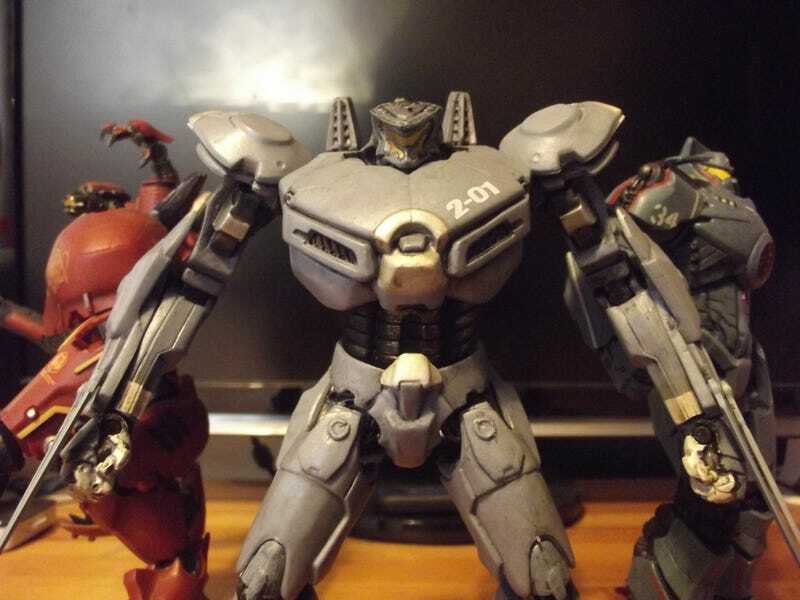 Striker Eureka might just be my favourite Screen-to-Toy transition of the Jaegers NECA have released so far. I suppose it's because out of Gipsy, Crimson and Striker it's the one with the design that feels the most 'toy'. It's practically bordering on Gundam levels, what with her superfluous wing attachments and wonderfully oversized ROBO-SHANKS. The blades might actually be my favourite part of the toy, too, for one reason: They're articulated. Striker Eureka is ready to rock! Or snip something. Snip something fierce. In fact, kinda like Crimson Typhoon, my only real problem is that there's the opportunity for too much articulating - very quickly Striker's articulated joints, especially the ones in her shoulders, can go from too stiff to too loose, and with heavier forearms thanks to the blades, it makes more 'actiony' poses harder to pull off. NECA have struck a great balance so far with the Pacific Rim Jaegers when it comes to this, and although I'm finding myself much more careful moving Striker about than Gipsy or Crimson, she's still got a great scope of movement to her. I will say one thing though, that I noticed creeping in with Crimson and are in full display here: NECA are slowly replacing ball-joint articulation points with swivel hinges, which is honestly quite a shame with these beautiful figures. Striker, like Crimson, has swivel-hinged ankles (unlike the ball-joints on Gipsy, which went even further and had an extra swivel hinge for heel articulation! ), but perhaps most disappointing is the downgrade of the wrist articulation too. It's perhaps not as necessary on striker as her hands are overshadowed by her forearm blades, but still... I hope that we aren't potentially seeing a downgrade in articulation as this line progresses, because if one franchise deserves NECA's renowned figure articulation, it's Pacific Rim. You want to pose these beauties! The sketches Wenchette found on Twitter for Cherno and Coyote give me a little hope though, as it looks like both will have a return to more detailed articulation, especially Coyote Tango. Holy crap!Coyote Tango!Check out the NECA twitter for shots of ChernoAlpha too! Striker is another damn fine entry in this line though. She looks great, has a ton of delicious articulation for posing, she's a great hulk of a figure. Although I'm finding that now the space I had allocated on my desk for Jaegers is quickly becoming full... I might have to do some rearranging ahead of Wave 4's Cherno/Coyote double-whammy. I can't help that they all look so good together!